360/VR filmmaking has officially entered the mainstream. With more and more cinematic filmmakers, broadcasters, and ad agencies turning their collective creativity towards 360/VR projects, we recently sat down with three early adopters to learn more about their experiences in 360° video production and post. Representing NYC, LA, and London, G2 Immersive, Koncept VR, and Surround Vision all specialize in cinematic VR production and post finishing. In fact, each company was an active beta tester in the recently launched, Mocha VR, our 360 optimized planar tracking and effects tool. Emmy-winning G2 Immersive Studios is a forward-thinking full service production, post, and design studio that leapt into 360 video content three years ago. G2 creates 360 content for interactive virtual reality and augmented reality as well as scripted, news, reality, and live genres. Projects have included: The Dakota Access Pipeline | This Is All We Have, Stan Lee’s Comic Con | Nerds Like Us, and Cannabis Prop 64. Recently, G2 used Mocha VR on two projects: the 360° short If Not Love by director Rose Troche, an official VR selection in 2017 Sundance Film Fest that takes you into the heart-wrenching world of a fictional mass shooting at a nightclub and asks what if things had turned out differently; and The Rook produced by VR studio Holor Media, which shows you what it’s like to be a rookie cop in Los Angeles. Koncept VR is the brainchild of the creative team behind Freedom360, the original 360 GoPro camera mount. The virtual reality agency has over five years of experience telling 360 stories in cinematic VR. Clients include: CBS Interactive, Coca-Cola, The New York Times, Mashable, and more. Mocha VR was used extensively on their journalistic project * Defying the Beast for World Vision*, a global humanitarian nonprofit for children in need. The project, which shot in Honduras, details the dangerous train-hopping freight train system that many Central Americans use to reach safer areas for better opportunities. The team faced many challenges shooting in uncontrolled environments where people would cross seams and get too close to the camera. 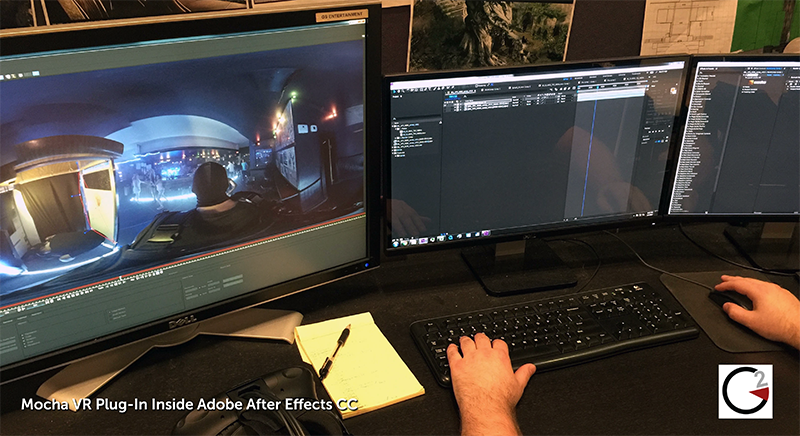 Koncept VR uses Mocha VR to complement their Adobe Creative Cloud and GoPro|Kolor workflow. 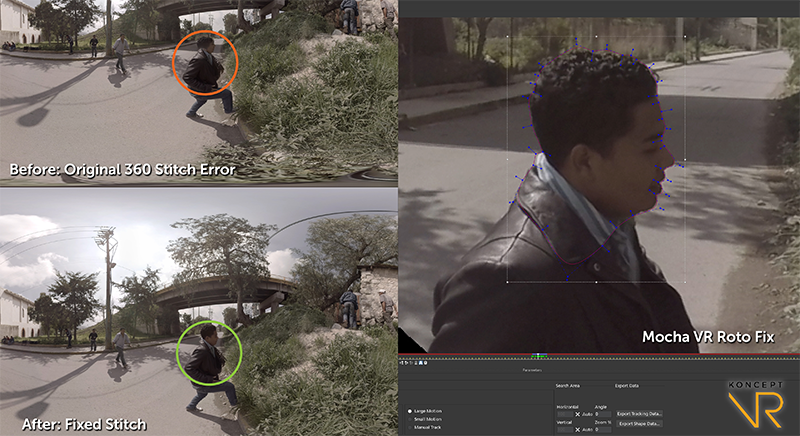 In the above image example, Koncept VR used Mocha VR’s masking tools to fix stitching errors. Surround Vision’s award-winning 360 content creation company was founded by Richard Nockles, who introduced 360 production to broadcasters in the United Kingdom in 2010. It’s no wonder the VR team was the first to develop ‘director’s view,’ ‘picture in picture,’ and other major VR technologies that are now widely used. Surround’s cutting-edge innovations mixed with creative storytelling make it a go-to for popular brands, broadcasters, and ad agencies, including: BBC, Tate Modern, Sky, Disney, RayBan, ITV, and the United Nations. Growing A World Wonder, a 3 minute VR film commissioned by UNCCD (United Nations Convention to Combat Desertification), was one such project. The short film takes viewers into The Great Green Wall project — an ambitious project to stop the Sahara desert from engulfing the Savannah plains by planting a wall of trees in Central Africa. In this 360 before/after example we see that Surround Vision used Mocha VR’s object removal tools to remove the camera operator from the shot. Mocha VR is available now as standalone application and a plug-in for Adobe After Effects CC, Adobe Premiere Pro CC, Avid Media Composer, The Foundry’s NUKE, Blackmagic Fusion and more. Download a free trial of Mocha VR.